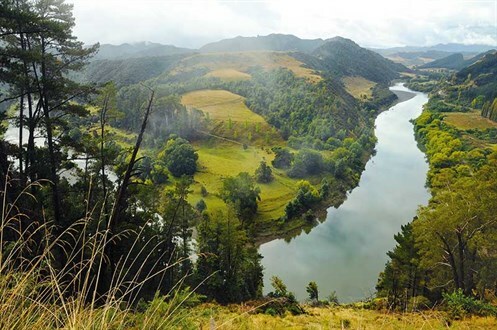 Liz Light follows the Whanganui River inland to historic Pipiriki. These are some of the highlights. The majestic Whanganui River has an ignominious end where it joins the sea. There’s an endless battle of currents as the river wants out and the ocean is wants in, in a spectacular display of curls and swirls, with the occasional breaker making its way inland between the two moles. The port area upstream of the moles has a ramshackle, rustic beauty with semi-derelict warehouses, a neglected railway line, and rusty equipment speaking of better days when this was a thriving port: the gateway to the central North Island. 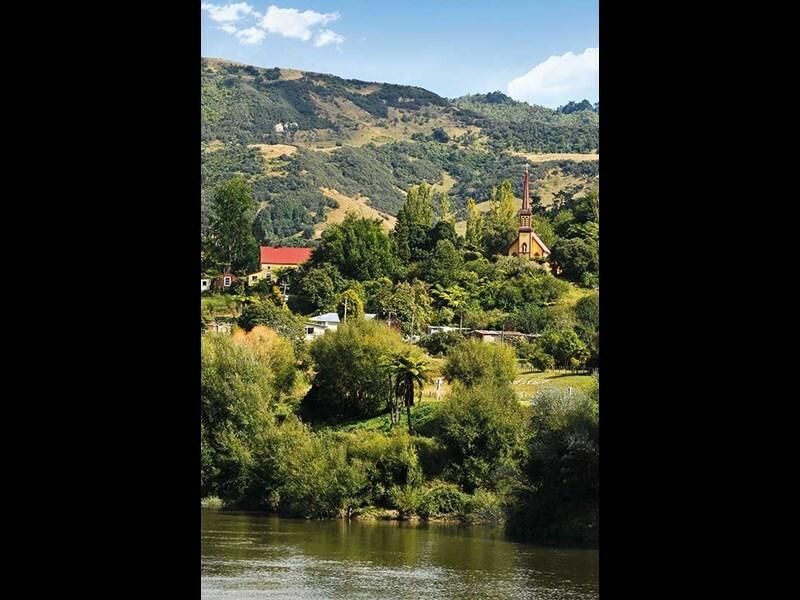 Six kilometres inland, the river becomes the gently flowing heart of Whanganui city with walkways, parks, and the occasional cafe opening on to it. Sam and I join the Waimarie, the last of the great paddle steamers that served on this river. Waimarie was launched in 1900 in Yarrow, England. She chuffed and puffed up the river to Pipiriki for 50 years, sank in 1952 and lay submerged for 41 years. 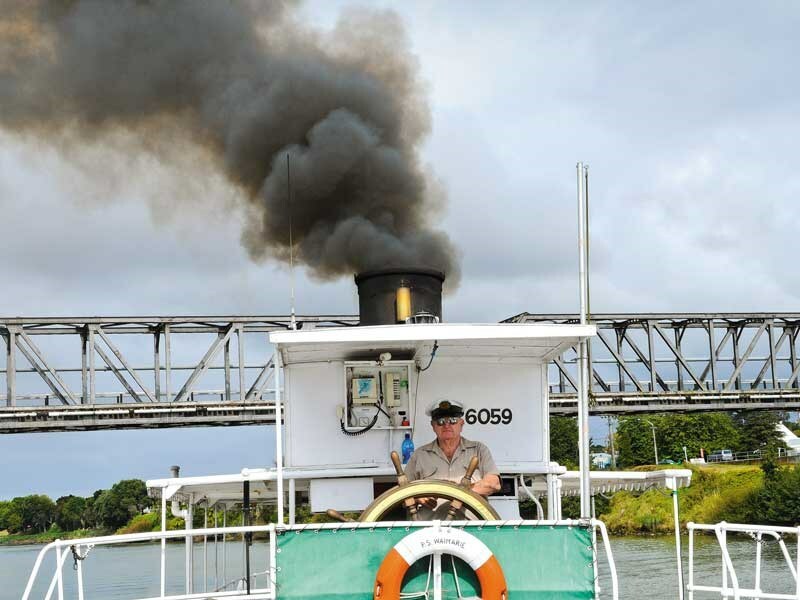 Steam and history enthusiasts re-floated and faithfully restored her to recommence river duty in 2000, this time taking tourists to Punahou and back, 15 kilometres up river. This is a boat with a pulse, a hot beating heart, and Captain Trevor Gibson is more than a little in love with her. "She’s my mistress. She likes attention, needs to be treated kindly, and has a will of her own," he says, with both hands firmly on the wheel as we make the return journey from Punahou. Later in the afternoon Sam and I reconnect with the river at Punahou and follow the Whanganui River Road to Pipiriki. At Aramoana summit, I look down the barrel of the valley it has carved on its way here – steep farmland, lush green river flats, dark rainforest, and Ruapehu in the far distance. The road follows close to the river, passing farms with colonial houses, and classic, corrugated iron outbuildings. Jerusalem, 18 stunningly-scenic kilometres further on, is the best known village in the valley, made famous by poet James K Baxter, who began a commune here in the 1970s. His bones lie at rest in the local cemetery. Sister Suzanne Aubert, from the Sisters of Compassion, started a mission at Jerusalem in 1883. The convent is still here and the sisters still teach at the local school. Willows line the river, houses straggle along the road and St Joseph’s church, yellow and red and high on the hill with a heaven-reaching spire, is surrounded by ponga, poplar and peach trees. There are 12 wild and curly kilometres to Pipiriki, the end of the Whanganui River Road, but not the end of the river that has 210 more kilometres to go to get to its birthplace on the snowy flanks of Mt Ruapehu. Pipiriki is a touristy spot, in a quiet way, with jet boats and kayaks leaving and arriving from the bush-surrounded upper reaches of the river. Sam and I sit on wharf steps, inches above the water and munch sandwiches. Kayakers arrive. Part of me wishes I was them, ending an adventure by water rather than a tamer journey by road. But it has been good – amazing, actually. I wonder why it took me so long to come here and know that, next time, I will stay longer. Parks and recreation: the Whanganui region is home to numerous family-friendly bush walks and reserves, such as Kowhai Park on Anzac Parade beside the river, Bushy Park, home to Ratanui, claimed to be the largest rata tree in the Southern Hemisphere, and Virginia Lake offering the Winter and Art Gardens and a full Aviary. Gardens of significance: Bason Botanic Gardens includes one of the most extensive public garden orchid collections in New Zealand, while privately-owned Paloma Gardens houses a collection of exotic plants from around the world. The Mountains to Sea Cycle Trail: stretching 84km, this route travels through two national parks, incorporates a jet boat transport link, and ends on the shores of the Tasman Sea at Whanganui’s North Mole. Durie Hill Elevator & Tower Durie Hill’s pedestrian tunnel leads to only public underground elevator in New Zealand, built in 1919. Ride through the hillside and enjoy panoramic views from the top platform and adjacent Memorial Tower. The River Traders: Whanganui’s weekly river-side market incorporates the Farmers Market and is in the same spot where, historically, Maori traded their produce. Festivals galore: Whanganui is home to many a festival, including Maori New Year celebration Matariki, the Festival of Glass, and the Whanganui Literary Festival. Visit whanganuinz.com to find out when and where. Whanganui Vintage Weekend: held during Wellington Anniversary Weekend, the event offers a broad range of entertainment for motorists, music lovers, foodies, and families.